Here’s a clip of soulful blues belter Otis Rush with a version of his 1956 single on the Cobra label ” I Can’t Quit You Baby”, a landmark single in his career that established him as a first-tier Chicago blues artist along with kindred spirits Buddy Guy and Albert King. With his powerful voice, and stinging left-handed guitar work, Otis Rush began his career as a hitmaker on the Cobra label, recording with Ike Turner, and scoring several R&B hits, including this one, from 1956-59. Today, Rush’s talent drastically outweighs his fame. Yet his early singles on the Cobra label established his voice in electric blues scenes in Chicago and beyond. And “I Can’t Quit You Baby” is a song that would become a part of the blues canon because of its unprecedented intensity. Led Zeppelin’s version of ‘I Can’t Quit You Baby” on their first album in 1968 brought the song to a mainstream rock audience. This band who borrowed so heavily from other blues musicians and their songs sticks pretty close to the Otis Rush’s here, perhaps because they had yet to make their name, or maybe that they saw no way to improve it. After all, listen to Rush’s performance on the clip. Get a load of that opening note that immediately rivets the audience to their seats, pulling their eyes and ears stageward. This is as powerful as any rock performance, and Rush seems to be able to pull this out of himself with very little effort, making his presentation something to behold. Otis Rush embodies something here which was true to his generation as an electric blues elder statesman. I find much of the electric blues genre in modern times to be slavish, and very often plain erstatz. Yet, Rush is the real thing, exuding confidence, showing mastery while never showboating, and putting across a performance based around his material, as opposed to one based around a set of aesthetics that have become associated with blues performance . Rush’s powerful and confident guitar chops influenced the playing of both Eric Clapton and Mike Bloomfield. And let’s not forget fellow lefty guitarist Jimi Hendrix, who would later go on to influence even more guitarists of both blues and rock persuasions alike. 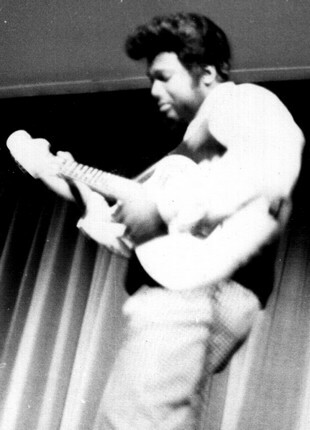 Otis Rush continued to record and perform until a 2004 stroke took him off of the road.